We’ve said it before on this blog, but Texas is *not* a ‘Red State’. If even a simple majority percentage of eligible voters in the Lone Star State actually decided to show up and vote, the political structure of Texas would look very different than it does today. At least, that’s the theory. So for 2018, we must ask once again. Will November 6th finally reveal a new, BLUE Texas? NACOGDOCHES, TX (KTRE) – Almost 16 million Texans are registered to vote in the upcoming midterm election. East Texas elections administrators say they’ve seen a sharp increase. “There’s definitely a lot of excitement in the air and a lot of people have gotten registered to vote,” said Todd Stallings, the Nacogdoches County elections administrator. That excitement is state-wide. This year, the Texas secretary of state reports that almost 16 million Texans are registered to vote this fall, 1.6 million more than the previous mid-term election in 2014. 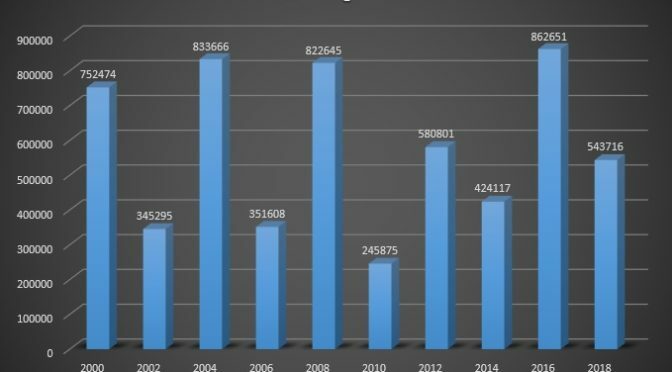 Texas Registered Voters For Primary Season, the General Election, and the difference between them from 2000 to 2018 (the final official number for 2018 is still pending. 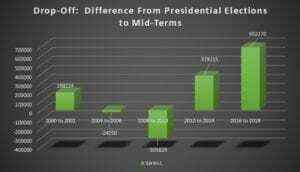 Like the data above, this shows the difference between voters registered during Primary season to the General Election. 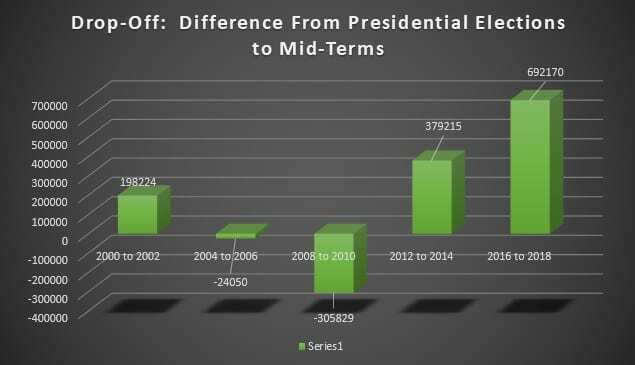 2018 is clearly historic for a Mid-Term in this measure… just shy of the gains made during the 2012 Presidential Election. 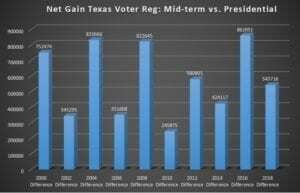 In previous years, Texas has even seen the number of registered voters drop off significantly from the Presidential voting year to Mid-Terms. But 2018 looks to show an impressive gain from the 2016 count… nearly double that of the difference between 2012 and 2014. 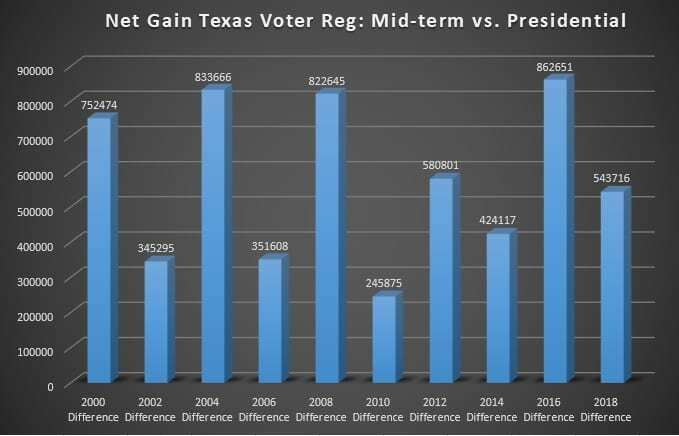 In 2014, Texas voter registration also surged to historic levels for a mid-term election, but then also ended with shockingly low turnout at the polls. For leaders in the Democratic campaigns and in Battleground Texas, it was a tough lesson to learn. So is an even more impressive number of registrants another sign of true change across the state? Was the last minute surge due to the Kavanaugh hearings, the “Taylor Swift effect”, or some strange combination of both? Regardless of the particular question, the answer is still the same. Don’t wonder about it… WORK FOR IT. The time is NOW to Block Walk, phone bank, talk to your friends and family, and even people you don’t know and share with them how critically important this election will be. Let’s get these voters turned out, and bring the new Texas to bear!! The Texas Progressive Alliance knows that no one has a constitutional right to be a County Clerk as it brings you this week’s roundup. Off the Kuff takes a look at the very high stakes of the voter ID appeal. Libby Shaw at Texas Kaos and contributing to Daily Kos asks why the U.S. cannot have high speed rail that is common in Europe and Asia? Why? The do-nothing GOP, of course. Republican Are Why We Can’t Have Nice Things. 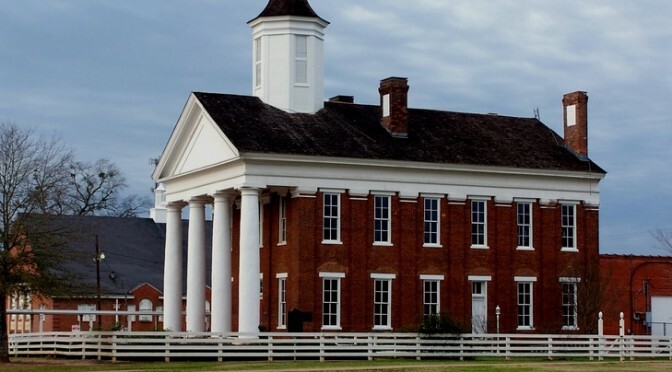 Socratic Gadfly, linking to the first piece he has written for an in-depth philosophy and social sciences webzine, explores the parallels between Constitutional originalism and religious fundamentalism. The best debate in the Houston mayoral contest happened last Thursday night, and PDiddie at Brains and Eggs blogged about it. Texas Leftist agrees with President Obama… the economic future of the United States may soon be inextricably linked to the world’s next great power player. Here’s why it’s time for Texas to take a new look at Africa. Plus some coverage as the Houston Unites Campaign kicks into high gear. From WCNews at Eye on Williamson. The Texas GOP has a problem with health care. They hate it and it shows, Common Sense Conservatism Is Bad For Your Health. Neil at All People Have Value was glad to see outreach by the Harris County Green Party on Labor Day. APHV is part of NeilAquino.com. Juanita unloads on Houston Mayoral candidate Ben Hall. Grits for Breakfast calls out Dan Patrick for misleading and incendiary rhetoric about crime and the police. The TSTA Blog rebuts a Wall Street Journel op-ed on the recent SCOTUS charter school ruling. Liz Goulding looks back on three years of being a one-car household. The Bloggess celebrated World Suicide Prevention Day. 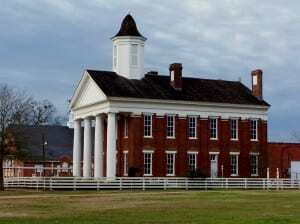 Today’s feature photo is of the Old University Building in Nacogdoches, Texas. Built in 1859, the structure was the main hub of Nacogdoches University— the first public higher education institution established by the Republic of Texas in 1845. Photo credit: City of Nacogdoches.